Many people remark on the homely and welcoming atmosphere, the moment they walk through the front door. This is because our residents’ needs and wishes come first in Arden House. We provide care and assistance where necessary and company or privacy as desired. We deliver this in an informal atmosphere, knowing that residents want to take a full and active part in making their own decisions. Arden House is a large Edwardian detached house, set amongst other family homes. The property has been a nursing home since 1946 and so is well known within the local neighbourhood. The property was sympathetically extended and enhanced in the early 1990’s to provide the current level of accommodation. All new rooms were designed to be above and beyond the regulations of the day for both size and layout. We are extremely proud of Arden House and our team. 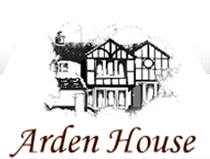 We understand that choosing a care home can be a difficult decision and that is why we invite you to speak personally to our Care Manager to find out more about Arden House. A large courtyard has been designed with raised beds and an easy sloped path for residents’ access. The garden is mainly laid to lawn, shaded in part by some mature trees, offering both residents and their families the chance for some relaxation in the fresh air. Gazebo’s are available in the height of summer to offer shade to those less mobile.